Many people choose a school district for their children to attend before they even begin to search for homes. Even those without children should take into consideration the school district when they buy their next home. Cities, neighborhood and communities in a well performing school district will generally maintain their property values. In most areas, you will also pay more for a home in one of the top performing school districts. Homes in Metro Indianapolis are no exception. Schools in Hamilton County where 5 High Schools ranked in the top 12 in Indiana, are where some of othe areas highest priced homes are. There are many great schools within the Metro Indianapolis area. 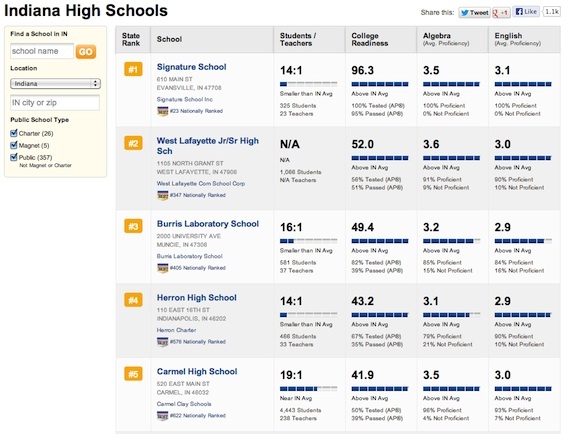 Check out the list by US News list of best High Schools in Indiana for 2013. The following schools received a Silver Medal for their academic achievements. The highest ranking high school in the Indianapolis area is Herron High School, a charter school located in Indianapolis. Herron ranked #4 in the state of Indiana for academic performance. Following at #5 in the state was Carmel High School in Carmel Indiana. Hamilton Southeatern School District in Fishers came in at #7 and #8 in the state for Hamilton Southeastern High School and Fishers High School, respectively. Westfield High School aso made the top 10, coming in at #9. I'm not sure why some schools were not ranked, but should note Zionsville Community High School scores placed them #2 in the state by College Readiness, even though they were not awarded a medal. I just wanted to say that you've done a great job with your website and blog. Content is king and you are hitting the nail on the head with your articles.